Many hotels of varying quality are available in North Korea. You won’t find any backpackers hostels or Airbnb listings, but classic hotel accommodations exist in every major city and range from 2-star soviet blocks sans regular electricity and hot water to 3-4 star international hotels to even 5-6 star deluxe resorts complete with private beach. Every hotel offers its own charm and unique quirks that are sure to make your stay a memorable one. Here are the most comfortable hotels to spend your nights with us in North Korea. It may surprise you that the most lavish are located outside Pyongyang! 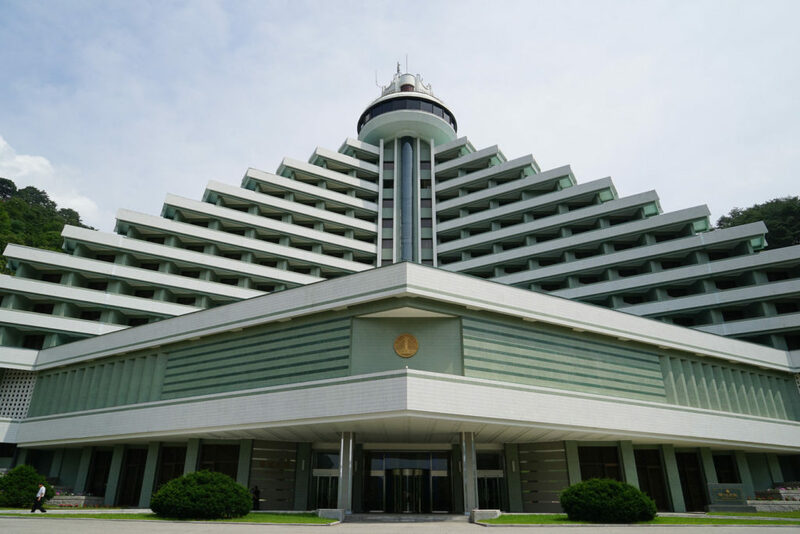 The Koryo Hotel is Pyongyang’s most iconic deluxe accommodation. It’s situated in the heart of the city nearby the Pyongyang Railway Station and is frequented by many of Pyongyang’s residents. The hotel is recognizable by its 45-floor twin-tower design connected by a sky bridge and topped by dual revolving restaurants. It’s said that this design represents two warriors with helmets holding hands to defend Pyongyang together. 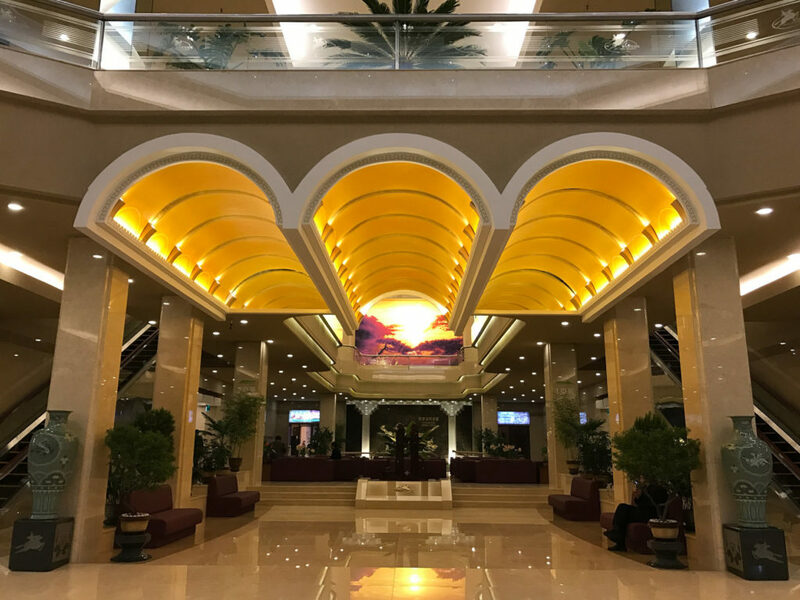 The hotel was built in 1985 and retains the Soviet-era style, but its reputation ensures it to be the first choice for foreign diplomats, delegations, NGOs and the local elite visiting Pyongyang. You’ll find a swimming pool, fitness center, sauna, massage parlor, karaoke room, hairdresser and even a tailor to get your own North Korean suit made in the basement. On the first floor there’s a tea house, restaurants serving Korean, Chinese, Japanese and European dishes and a souvenir shop filled with North Korean merchandise. The second floor is home to a café, library and bookshop, billiards room, screen golf, photo service and a place to make international calls. Outside the hotel is a brewery and foreigners are able to visit at any time, even without a guide. Needless to say, the prestigious Koryo Hotel is the perfect place to unwind after a day touring Pyongyang. Any night spent in Pyongyang will be at the Koryo Hotel. It will be your home away from home on any of our tours! The 6-star Hyangsan Hotel nestled within the valleys of Mt. Myohyang (‘Mysterious Fragrance Mountain’) is a guaranteed head-turner. It’s a 15 story layered pyramid with 120 guest rooms and a revolving restaurant that looks more like an air traffic control tower. Hyangsan Hotel was built in 1986 and beyond its Stalinist exterior, the inside will greet you with sheer opulence in shined marble flooring, gold trimmings and ornate flower displays. Your room guarantees comfort with a western style bed, lavish and spacious bathrooms, complimentary dressing gowns and a private balcony to enjoy the fresh mountainous air. Amenities include a swimming pool, beauty salon, hairdresser, souvenir shop, four restaurants and a brewery. To keep you busy in the evening there is also table tennis, billiards, a dance hall, karaoke room and a bar. This hotel is one of the very few places in North Korea with regular (but not guaranteed!) internet connectivity for foreigners. Mt. Myohyang is a popular vacation spot for North Korean tourists. For those that can afford it, Hyangsan Hotel is their first choice. You’ll stay in the exclusive Hyangsan Hotel on an overnight trip to Mt. Myohyang to visit the International Friendship Exhibition, Pohyun Buddhist Temple and hike Manphok Valley. Marshal Kim Jong-Un personally initiated construction of the world class Masikryong Ski Resort in 2013 and it took the Korean People’s Army just ten months to complete. The result is a spectacular 1400-hectare complex with 10 ski slopes complete with modern cable-ways and travellators. Your lodging will be at the Masikryong Hotel, made up of two buildings with 123 rooms giving the impression of a cozy mountainous village within the forest. The interior is decorated in natural log with rustic dinner tables and chairs, timber roof fittings and pillars, faux fireplaces and dim mood lighting providing a homely atmosphere. Your arrival will be a first-class affair met by a bellboy with a golden luggage trolley and reception staff that are dressed in a suit and bow tie, complete with pocket square. The rooms are designed as wood-grain cabins with deluxe bathrooms, complimentary dressing robes, a private balcony facing the fresh powder slopes and arguably the best beds in North Korea. In the basement, there’s a swimming pool, hairdresser and beauty parlor. The first and second floors contain a café, bookshop, souvenir shop, billiard tables, karaoke, dancing hall, photo service and an international telecommunications center. In true North Korean style, there’s also a revolving restaurant on the top floor. 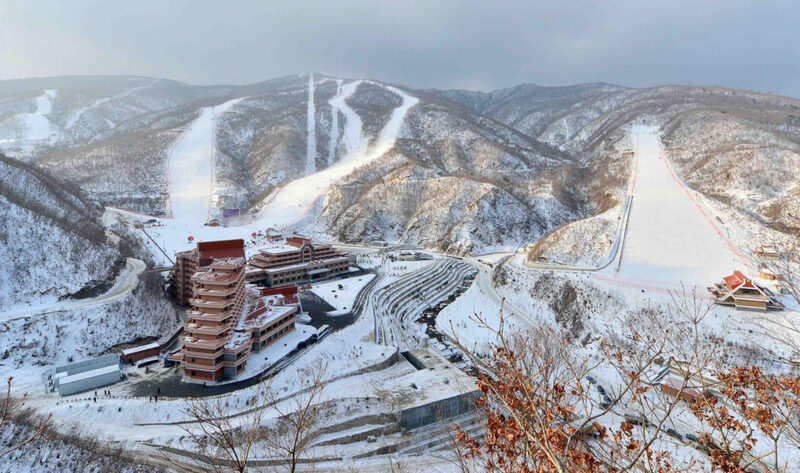 The luxurious Masikyrong Ski Resort is well known to all North Koreans, regularly appearing in State media as an exemplary achievement of the Korean people. It is a fascinating peek into the lives of the elite and affluent in North Korea. You’ll stay in Masikryong Hotel all year round if you visit Wonsan on any of our tours, or on our designated Ski tours during the winter season. 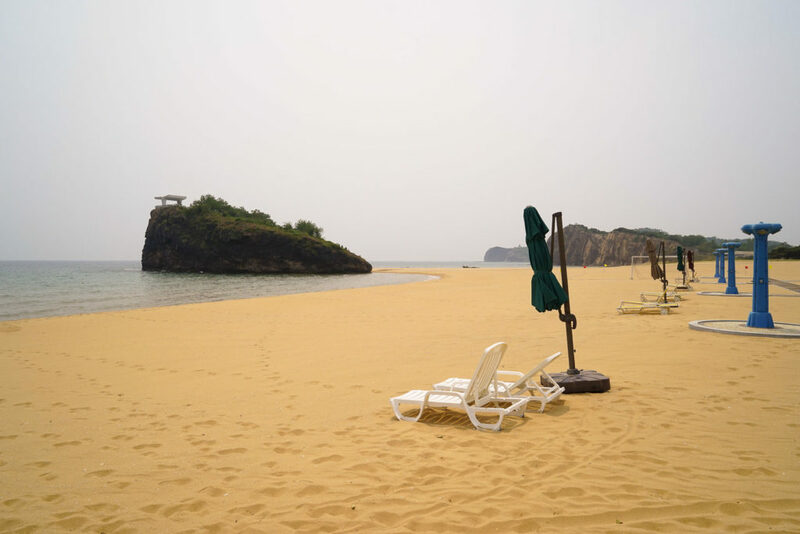 Not to be confused with the nearby 2-star Majon Beach Guesthouse, the 5-star Majon Hotel is secluded on it’s own private beach in remote Hamhung on North Korea’s east coast. The hotel was opened in 2009 and consists of 3 buildings collectively in the shape of a flying seagull, housing 108 rooms of differing levels of luxury. Just in front of the hotel stretches a golden sandy beach; the sound of waves rolling to the shore provides the perfect setting for sunset watchers. You’re able to stroll the coastline, swim or surf freely, perhaps soak up some sun on the beach chairs, or even visit a rocky island nearby topped with a seagull-shaped pavilion. Majon Hotel allows you to join locals in beach activities such as volleyball, body boarding, frisbee and spike ball. During the right time of year, it’s also a great environment to learn how to surf. For dinner, the local specialty is a clam bake cooked for you right there on the beach and it can’t be missed! The hotel provides a swimming pool, folk game hall, dancing hall, table tennis, billiards, bowling alley, souvenir shops and a bar. Majon Hotel is North Korea’s finest. It’s the hotel that our travelers never want to leave. It’s an unexpected relaxing getaway in one of North Korea’s most inaccessible areas. You’ll stay in Majon Hotel on an overnight visit to Hamhung and Pujon County, or on our signature surf tours. Want to experience these hotels for yourself? Check out our available group tours, or organize a tailored private tour to your interests. If you have any questions, please contact us!